Shop Women & Children First in July! We are proud to announce that Chicago’s fabulous feminist bookstore, Women & Children First, has made us their organization of the month for the month of July! 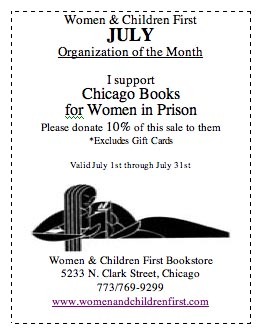 This means that W&CF will be generously donating 10% of every purchase to Chicago Books to Women in Prison. All you have to do is print out this coupon and present it at the time of purchase. Stock up because this promotion only lasts through July! A big THANK YOU to Women And Children First for supporting our organization!